Global economic growth slowed down in 2012. One of the reasons for this was that the euro zone – still going through a sovereign debt crisis – slid into recession, taking major trading partners with it. The markets were also weighed down by uncertainty regarding fiscal problems in the United States and China's economic prospects. According to a projection by the International Monetary Fund (IMF), global economic output only increased by 3.2 per cent, compared to 3.9 per cent in 2011, whilst advanced industrial nations achieved growth of just 1.3 per cent (2011: 1.6 per cent). The pace of growth also tailed off in the emerging markets. All four BRIC countries registered lower rates of growth than in 2011 owing to declining demand from Europe and, in particular, dwindling domestic demand and economic policy aimed at stemming inflation in Asia and Latin America. Demand for machinery and equipment weakened globally, but especially in the euro zone. A declining willingness to invest was accompanied by a slowdown in the growth of global trade, which more than halved according to the IMF’s projection. This brought it down to just 2.8 per cent in 2012 (2011: 5.8 per cent). Imports and exports decreased in equal measure. 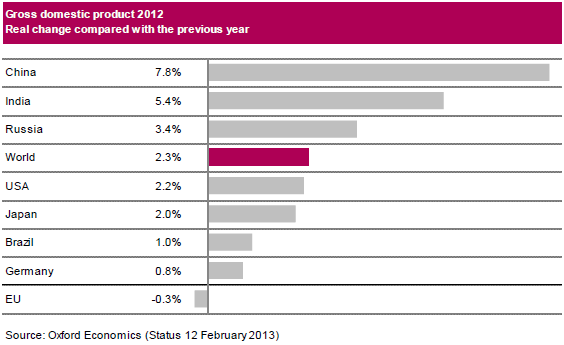 Unlike in the previous year, demand for industrial trucks therefore received little stimulus from the markets in 2012.